Scottish Energy Minister, Fergus Ewing visited Oceanflow in Renfrew as we prepared to load out the completed E35 device at the river Cart to announce the latest round of WATERS funding. 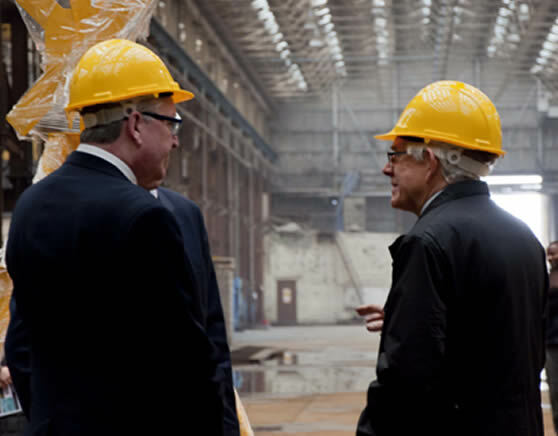 During the visit the Energy Minister was given a demonstration of the device's unique control system in operation and also had discussions with Oceanflow MD Graeme Mackie about the future of the project. Oceanflow was pleased to have the opportunity to show the Minister the complete E35 device prior to it's development in Sanda Sound, South Kintyre. "Scotland is leading the world in the development of marine renewable energy. We are at the forefront of developing offshore and low carbon energy generation technology with some of the world's greatest wind, wave and tidal resources heavily concentrated in the waters around our country. I am excited today to see firsthand the investment made by Scottish Government in the development of Oceanflow prototype and the launch of this device." "Our ambition for Scotland's emerging wave and tidal sector remains great. We know that the successful harnessing of ocean power takes hard work and persistence and the Scottish Government is determined to support those within the industry." "Scotland with its strong tidal stream resource was the obvious place to test our semi-submerged Evopod turbine and securing the WATERS grant support from Scottish Enterprise made it all possible. There is tremendous potential for this type of renewable power technology both in Scotland and overseas and we are looking forward to hooking up the word’s first grid-connected semi-submerged turbine in Scottish waters later this year."